In an attempt to solve this dilemma, we as teachers (and more often than not resource writers as well) try to include ‘real-world’ examples of when students might use the mathematics. There are obviously cases where this is true say for teaching money a class shop would be appropriate, or for teaching fractions, using cooking recipes may be helpful as links to when the mathematics will be useful. But as Dan pointed out, it’s not always the solution and if the mathematical nature isn’t obvious to you, then it won’t be for your students either. He showed examples of poor attempts where maths worksheets tried to link mathematics to the ‘real-world’ of dogs and whales! They seem ludicrous, but I think we do it all the time. Finding out what students like isn’t just about inserting celebrity names into problems to solve either, but focusing on what the students are doing to increase motivation and to focus on the intellectual need for mathematics, not just that you’ll need it for a job later. Dan talked about putting students in a place of pain (he’s evil I know!) or inefficiency so they can see the need for learning the mathematics, seeing that mathematics is real in itself and that mathematics allows us to function more highly and efficiently. This puts students in a place of power not punishment when undertaking mathematical tasks. 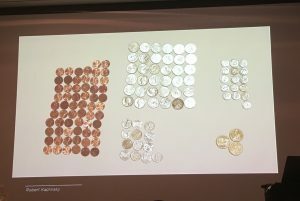 We do this as early as Kindergarten (and Dan showed a similar example), when you want students to learn more efficient counting strategies than counting by ones, you need to provide them with a large number of counters or coins. You create the need, knowing that if I don’t find a more efficient strategy, it will take forever! There is a lovely lesson on youtube that shows this kind of task. It’s about matching the problems to the tool students will need, if counting by fives is the Asprin, what’s the headache? There are many helpful tools in mathematics, Dan mentioned that it’s no good giving them the pill (textbook) without the headache. You need to maximise the need (pain) so students see the need for a simpler solution (pain relief). Thank you Dan, thank you. I think for your efforts you deserve one clap (excuse the conference in-joke!). 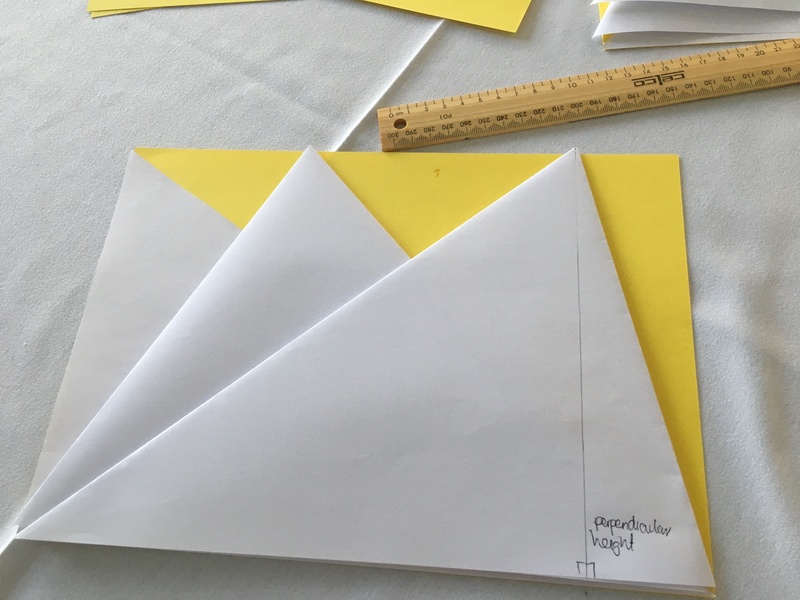 There were a number of other workshop sessions I attended that provided firm pedagogy for teaching primary mathematics and practical advice and activities. 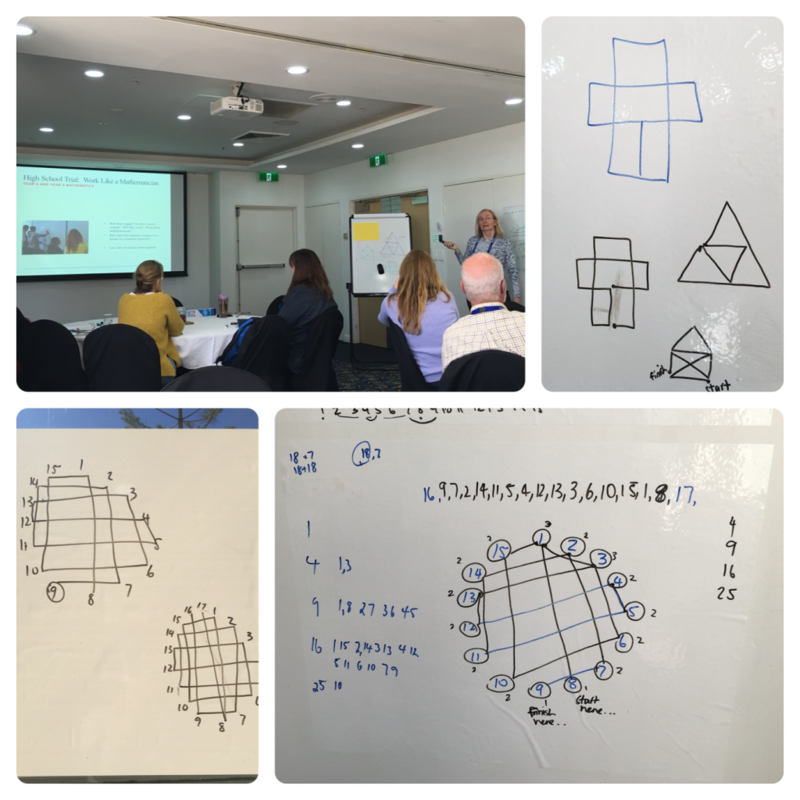 Linda De Marcellis and Ayesha Ali Khan from the NSW Department of Education (follow @DoE_Mathematics) ran a great session which focused on mathematical reasoning and communication. 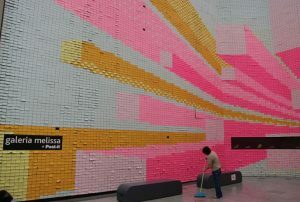 We were shown the image above and given the task to think about the room we were in and work out how many post-it notes it would take to cover the walls (on a side note you should check out #howmany on twitter and the book How Many by Christopher Danielson). This was a great task! Each group had different ways of solving the problem, yet our estimations were all fairly close. “Intentional teaching is deliberate, purposeful and thoughtful. 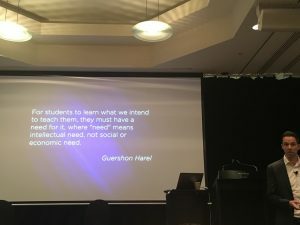 Educators who engage in intentional teaching recognise that learning occurs in social contexts and that interactions and conversations are vitally important for learning. They actively promote children’s learning through worthwhile and challenging experiences and interactions that foster high-level thinking skills” (EYFL page 18). Which is why questioning is so important (Kris and Bronwen use the hinge questions in The Formative 5). It’s the moment students move from what they know- the known, to the unknown, making connections to prior knowledge. That’s understanding, and that’s what you want to capture in your data, then use it to plan forward. We also need to focus an equal amount of time on what we are doing as to what the students are doing. Active learning and active involvement is for us as well. Flexible teaching and flexible learning. In relation to questioning and intentional teaching, I would also recommend to teachers the book Intentional Talk by Elham Kazemi and Allison Hintz. This is an excellent resource, a must for all primary teachers wanting to improve their own, and their students’ communication skills in the mathematics classroom. Christine Mae’s presentation was a stand out for me at the conference. Christine’s (and Michelle Nashaty’s) session had a focus on formative assessment and ensuring that all tasks are quality and are worthy to be used as assessments. The ability to find, adapt and create quality tasks “crunchy problems” comes from the teacher’s own pedagogical and content knowledge. Christine focused on quality instructional practices such as those in the book 5 Practices for Orchestrating Productive Mathematics Discussions by Margaret Schwan Smith and Mary Kay Stein (an excellent read by the way). Research into Teacher Noticing (Christine mentioned Jacobs and Lamb’s work specifically) was also highlighted as a fundamental practice for guiding teachers to notice- attend- and make decisions in response to student behaviours and understanding during the lesson. 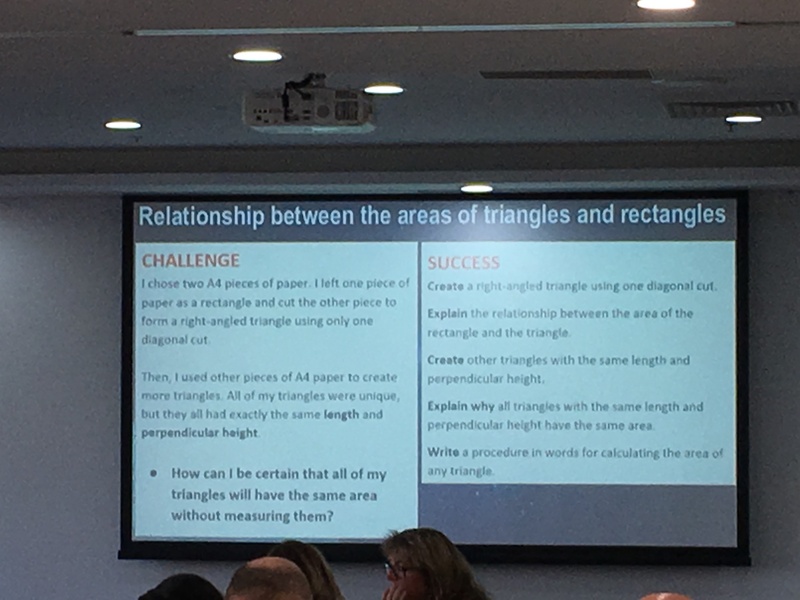 The triangle area task provided in the session was a fabulous open task and Christine used the Launch, Explore, Summarise model (with the inclusion of consolidate) in guiding us through the task. She also used the fish bowl teaching strategy where the rest of the class stand around one or two groups at a table to focus students on different solution strategies. For an example of a lesson designed around the Launch, Explore, Summarise model see Stringy Shapes in our resources section. Tricia Forrester and her UOW colleagues also presented a fantastic session on ulitising vertical whiteboarding in the classroom. It was highly engaging and had us working on the whiteboards from word go. The session also made strong links to the research behind whiteboarding, both Tricia’s research and that of Peter Liljedahl (both referenced below). Along with a great task linked to networks (ordering the numbers 1 to 15 so any two adjacent numbers add to a square number), the use of visibly random groups, and cool ‘magic’ whiteboard plastic (that I’ve now ordered!) the session left us wanting more and ready to try out vertical whiteboarding in our classrooms. A great workshop choice for Sunday morning! Overall this year’s conference was a wonderful celebration of all things mathematical. Thank you to all who organised and presented. 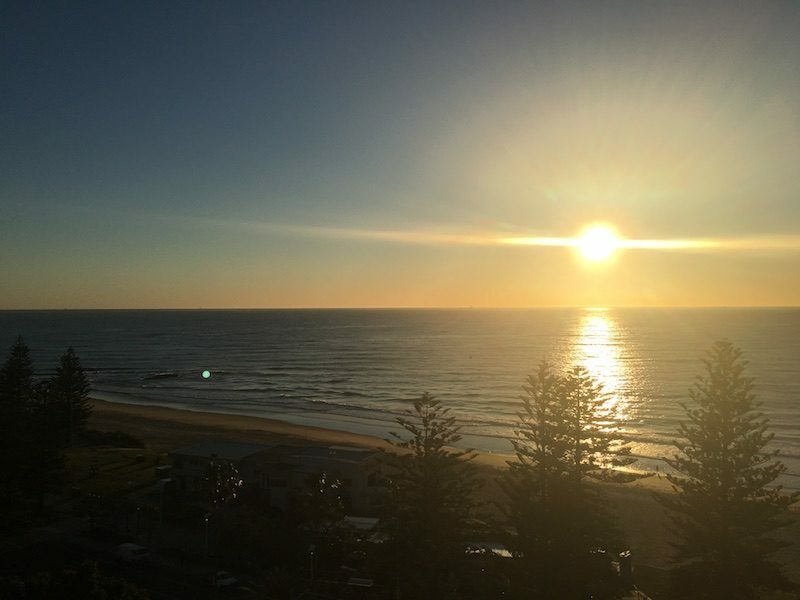 If you’ve not been before to a MANSW conference I highly recommend it, next year’s annual conference will be in Terrigal on 20-22 September, and if you are a @Numberphile or @MathsInspiratn fan like me, you’ll be excited to here that Matt Parker will be one of the keynote speakers! So keep an eye out on the MANSW website for when registrations open, I’m sure it will sell out fast as it did this year. 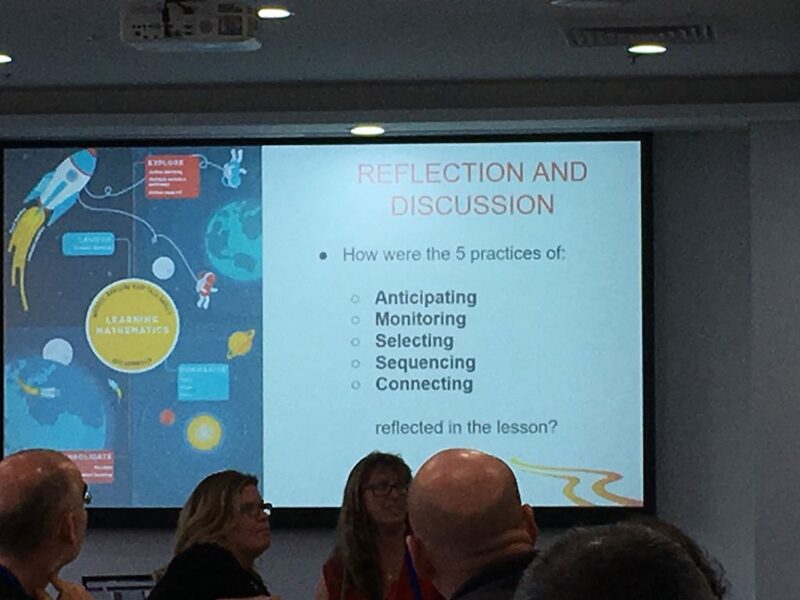 If you are a member of MANSW (you are then also a member of AAMT) you may like to visit the AAMT shop if you are looking for 5 Practices for Orchestrating Productive Mathematics Discussions or other good mathematics resource books. Forrester, T., Sandison, C. E., & Denny, S. (2017). A Secondary Mathematics Teacher’s Perceptions of her Initial Attempts at Utilising Whiteboarding in her Classes. 40 years on: We are still learning!, 261. Forrester, T., Sandison, C. E., & Denny, S. (2017). Vertical whiteboarding: Riding the wave of student activity in a mathematics classroom. Australian Mathematics Teacher, The, 73(4), 3. Liljedahl, P. (2016). Building thinking classrooms: Conditions for problem solving. In P. Felmer, J. Kilpatrick, & E. Pekhonen (Eds. ), Posing and solving mathematical problems: Advances and new perspectives. New York, NY: Springer.